Watch this space for awesome events and parties across your city. Enjoy with splash of water fights and colours at fun parties in Mumbai this Holi, or hide from the colour smoke crackers at special getaways (we won't call you chicken, promise). 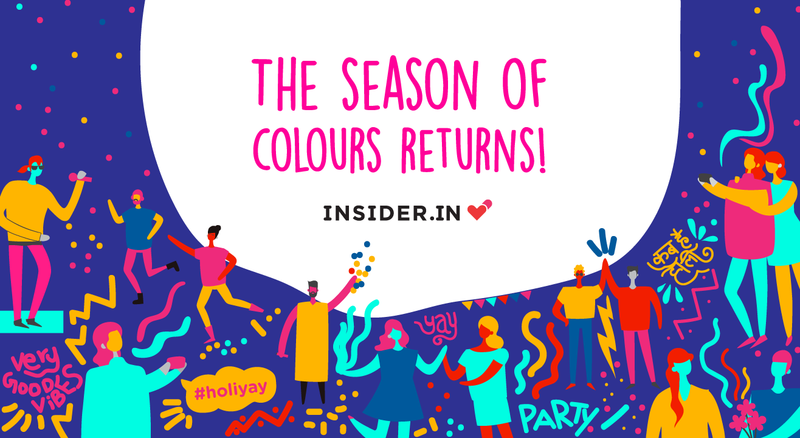 Use code HOLIYAY to get 25% OFF up to INR 250 per transaction on purchase of 3 or more tickets. Buy tickets on the Insider.in app with the code to get extra INR 50 in your Insider wallets usable against movie bookings only. The amount will be credited within 72 hours. Plus, this offer can be availed only once. Whether you like spraying colours or getting away from the city, we've got your back. There are Holi parties at Kora Kendra Ground 3, Country Club, Centre for Excellence in Telecom Technology and Management, Nesco Center, Wilson College Gymkhana and Imagica Theme Park. You can also take your party to nearby places like Bhandardara, Dahanu and Alibaug. Price isn’t an issue because we’ve you covered with tickets starting at INR 499. What you can expect at the parties? Organic colours, rain dances, bhang, gourmet food, premium liquor, photo booths and tons of surprises. Groove to live thumping music as the best artists present multi-genre eclectic acts. If dancing is not your thing, travel amidst nature and celebrate with a camping experience, colours, water, and a bonfire to top it off. Why not make the celebration a fun one for the planet too? Stroll along beautiful beaches, witness a spellbinding sunset from the shore, play some games and relax by the cool breeze from the sea. There are several popular beaches near Mumbai (thank you, Konkan Coast!) : Alibaug, Revdanda, Guhagar, Bordi, Ganpatipule and more. If you want to stay outdoors without any city distractions, camp at a Lakeside. Pitch your tent close to the lake and have a campfire, enjoy a barbeque dinner and listen to some amazing music. Popular lakesides near Mumbai are Pawna and Bhandardara.